Homemade fried yeast donuts, cut into heart shapes for a special Valentine’s Day treat and topped off with sweet strawberry icing. I did something the other day that was, if you ask me, pretty genius. And I don’t know why it didn’t occur to do this until now. If I leave an open bag of candy on the counter or in a drawer, no fail, it’ll disappear fast. Not just from me grabbing some here and there but sneaky little fingers stealing some when I’m not looking. Or in some cases, when I am looking. They’re risk takers like that apparently. And I’m a total candy addict. Big issues and bad combinations. So, the other day it hit me… I grabbed a mug and threw what remained of a bag of Hershey’s Kisses into it, placed it on my desk and let it be. Not only have I managed to partially forget about it, but the kids haven’t touched it… because it LOOKS like a a regular cup of (insert your favorite hot drink). Of course now that I’m writing this out, I’m sure they’ll disappear from that mug within the next 24 hours. You just wait. 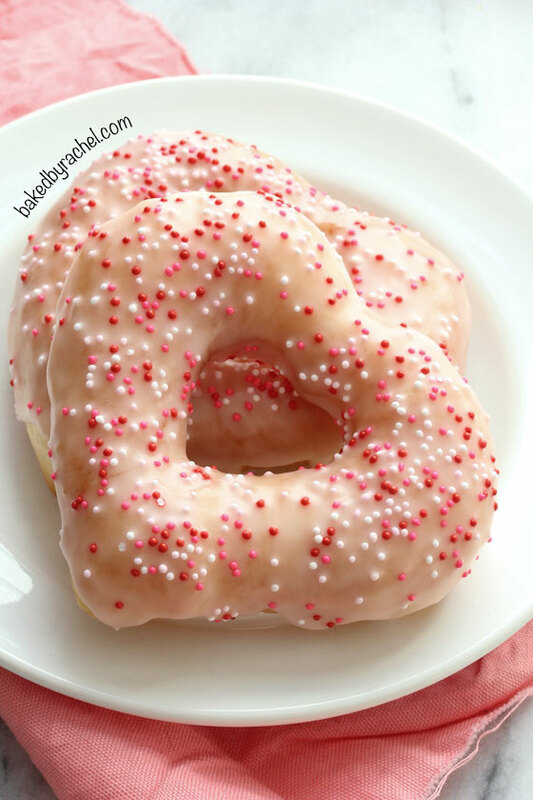 So I made you donuts, from the heart and in the shape of hearts, covered in pink strawberry glaze and sprinkles. 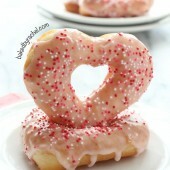 Because one should never stop at just heart shaped donuts… they’ve gotta be pink and sprinkled with equally cute colors. 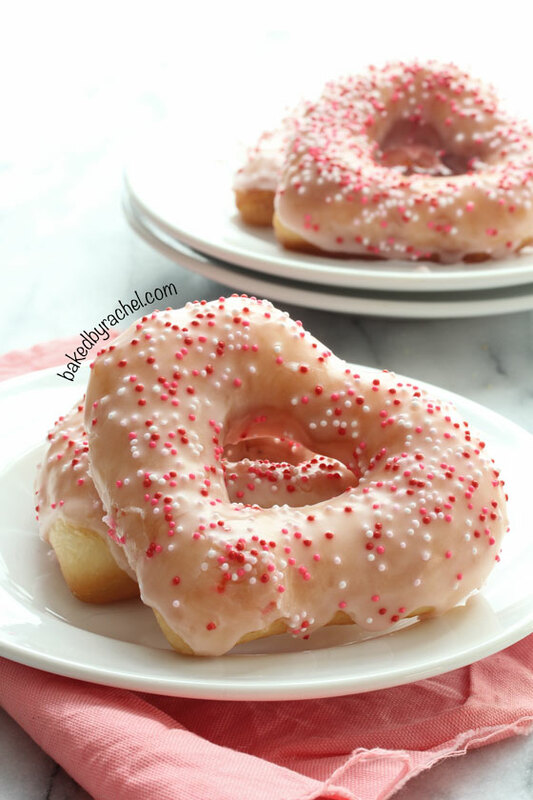 Who wouldn’t love a deep fried donut for Valentine’s Day? Seriously. Every kid and adult would enjoy it. Flavorful, fluffy and just perfect for the occasion. Maybe I’m stretching? But seriously, these were super tasty (aka they disappeared in my house within 12 hours of making them… or a lot less). And there was just something extra fun about cutting out hearts instead of boring circles. Plus, sprinkles just make everything better and happier, right? Sprinkles are a must. A perfect breakfast or snack for your Valentine, or just because. Homemade fried yeast donuts, cut into heart shapes for a special Valentine's Day treat and topped off with sweet strawberry icing. In a measuring cup, combine warm milk with yeast and sugar. Allow to proof for 5-10 minutes. 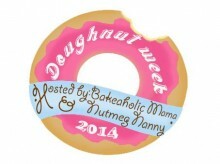 In the bowl of a stand mixer with dough attachment, add remaining dough ingredients. With mixer running on low-medium speed, add yeast mixture. Increase speed as needed until dough comes together. Dough may be sticky. Lightly grease your hands and a medium bowl with baking spray. Shape dough into a ball and transfer to prepared bowl. Cover and allow to rise until doubled in size or roughly 45 minutes. Prepare a baking sheet with a lightly grease sheet of parchment paper. On a lightly floured surface, roll out dough to 1/2-inch in thickness. 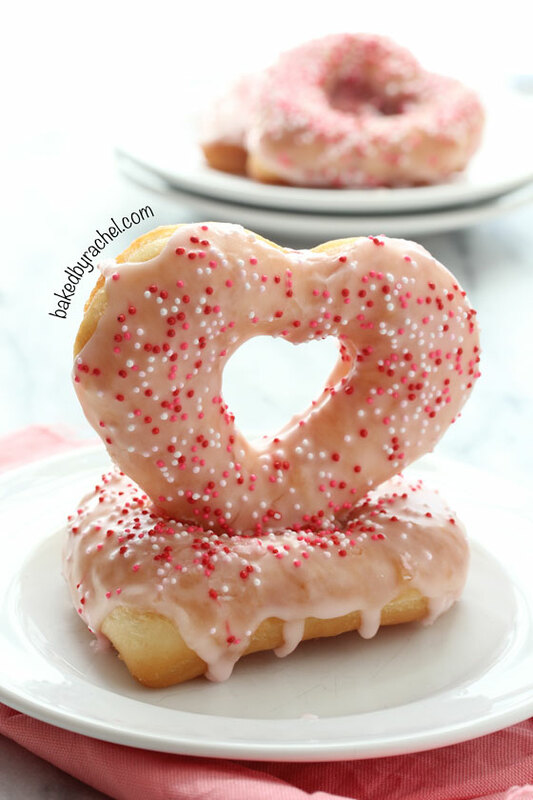 Cut out donuts using large heart cutters. Remove the centers with small heart cutters. Transfer dough to prepared pan. Repeat with remaining dough. Heat oil in a large stockpot to 325°F, monitoring with a Taylor Candy and Deep Fry Stainless Steel Thermometerdeep fry thermometer. Fry donuts 2-3 at a time until lightly golden on each side. Remove to a paper towel or wire rack to cool completely. Beat together glaze ingredients in a medium bowl. Dip cooled donuts in glaze and immediately decorate with sprinkles, if desired. Yields 6-12 donuts. Final yield will vary depending on cutter size used.